It’s summer time. Time to enjoy the great outdoors. The natural world. Where once your phone runs out of power, it’s gone. Sure you could charge it up again in your car, but that could prove problematic if your nearest car park is the other side of a range of mountains. Which is why this new product is so cool. It turns fire into electricity. 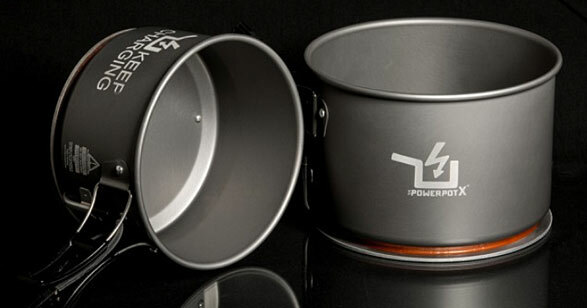 The PowerPot X is made for the outdoor life all right, but it’s a super versatile little beast. Not only will it let you cook stuff, but it can also charge up your devices. This new X model differs from the original with double the power (at 10W and 2amps), so it’s great for charging tablet computers as well as humble phones. It works with any USB device as well. Your mobiles, digital cameras, etc will all be happy to connect with this device. And hey, it helps you cook too, so it pulls double duty. Sausages and selfies, what could be better? It works by harnessing the heat differentials in different materials. The hotter the fire, the colder the water, the faster the charge. 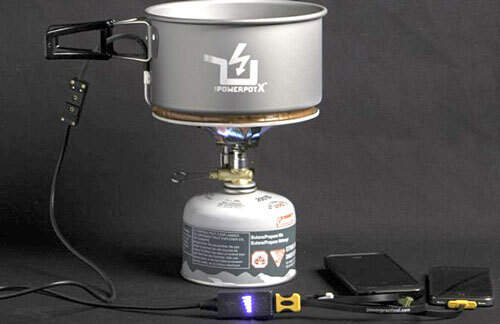 As long as you can find some water to put in the pot, you can use this charger anywhere and under any conditions. Aside from the pot it also comes with a fire resistant connector so you don’t have to worry about “death by fire” being one more way to lose a USB cord. The PowerPot X will be available next month for $219, and will probably be the most versatile piece of cooking equipment you’re likely to own.